It used to be a reference to someone who could NOT hold on to rebounds or catch passes in basketball. In Chin Na (grappling) the phrase has quite another meaning. One method for improving grip strength is to lift specially shaped very smooth stones. From left to right: the white stone is 10 inches high and weighs 9 pounds; the green stone is 13 inches high and weighs 14 pounds; and the black stone is 14 inches high and weighs 17 pounds. 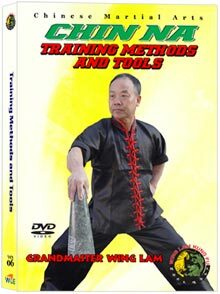 All are available at Wing Lam’s (WLE.com) – the video VCN06 (or VCN06D for the DVD) is also recommended. A gripping experience. Pictured below is a Dragon Claw ring. These are usually made of metal with an inside diameter of 4.5 inches and an outside diameter of 6 inches. They are just over 2.5 pounds each. They are used to strengthen one’s grip – the spread fingers (see below) are used to grip the ring and then you lift it to shoulder level. It is a bit more honest to lift one on each arm at the same time. I am informed that over time minute particles of brass will be rubbed off and absorbed into the skin, reinforcing the fingertips (or forearms if the other rings are used) to make them stronger and heavier. Trace amounts of raw brass are even used in many Dit Da Jow formulas. By comparison, steel is believed to be toxic when absorbed by the skin, and chrome plating flakes off, causing the risk of cutting the skin. A common use for smaller (3/4 inch inside diameter; 4.75 inch outside diameter) rings is to wear on the wrists while practicing sets, blocks and punches. The ring shown below weighs 1.35 pounds which does not sound like much until you are several minutes into a vigorous Hung Gar set or are doing 1,000 punches. I am not altogether sure what happens if you block an incoming punch while you are wearing rings. If you still have enough speed to intercept the enemy punch I’d imagine his forearm will be painful. The rings described are for experienced students. The medium-sized versions are 1.15 pounds with 3.25 inch inside diameter and 4.375 inch outside diameter. The limiting factors are being able to get your hand through the rings and not having the rings slip off when you punch or block. 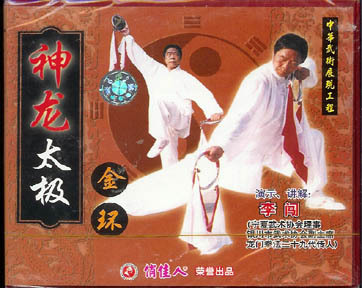 According to Grandmaster Wing Lam “when you strike with real power and speed, the rings make a distinctive sharp clang that any genuine master will recognize as true kung fu skill”. The demonstrator is Chuang Li. He has two other VCDs – Roads 1 and 2 -immediately above on the same page. The yellow robe trimmed with black works well with the famed wolf tooth mace. The golden tassels of weapons like the Mandarin Coin knives have to be positioned with some separation from the robe. There’s at least one collateral effect – spreading one’s arms with the wind behind oneself creates something of a sail effect. The same requirement for distancing the two yellow elements can be seen here for longer tassels attached to the double straight swords. In retrospect, I should have work a warmer under-shirt with long sleeves. Holding the famed Nine-Point Rake. Actually, since the bottom is a spear point, I’d argue it should really be called the Ten-Point Rake. In any case, wearing a different Taoist hat scarf. This style is attributed to Zhuangzi or Nanhua Zhenren (The Perfect Man of the Southern Flower), so it is called Zhuangzi Jin or Nanhua Jin. He was an influential Chinese philosopher who lived around the 4th century BC during the Warring States Period. His name is sometimes spelled as Chuang Tsu, Chuang Tzu, Zhuang Tze, Chouang-Dsi, Chuang Tse or Chuangtze. 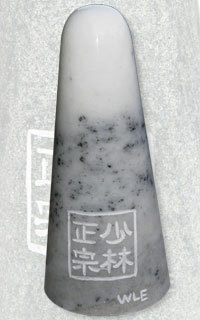 The famed Coin Coin Snake Spade with a black purfle’ with white trim worn over a full-length white robe with oversocks and a Nine-beam Hat Scarf (九樑巾 = Jiuliang Jin). The hat scarf has a angled top like the roof of Chinese tiled houses. The front has nine folds and nine beams. It is also called the Chunyang Scarf after the immortal Lu Chunyang as well as the Letian Scarf after the poet Bai Letian. Wang Chongyang, the founder of the Complete Perfection Sect ( 全真派 = Quanzhen Pai ) of Taoists, also wore such a hat. Today, this hat scarf is most commonly worn by Orthodox Oneness ( 正 = Zhengyi ) Taoists. Green arrows indicate either in Chinese only or a special order or both. Note that the DVD version (10210) of 210 has English.